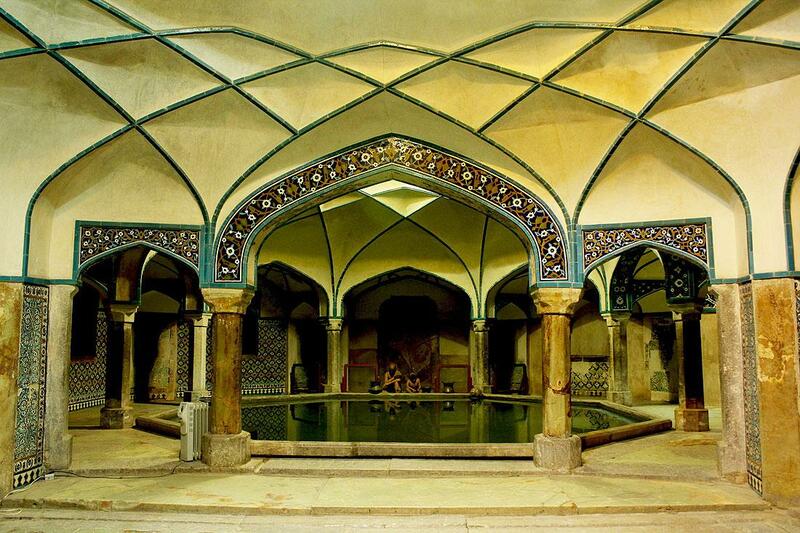 For Iranian, having a bath in addition to cleansing the body, is a religious ritual. In all pre-Islamic religions like Zoroastrianism bathing was one of the necessary conditions of participating in ceremonies. Many signs of the existence of baths were found in Persepolis by archeologists, and it was concluded that the construction of public baths was common in all cities of Iran since the Achaemenid era. The architecture of these bathrooms or Hammams are very different from the design of modern bathrooms. In the old days, the bathroom was composed of four parts called Sardine, Garmkhane, Khazine, and Chalhoz, and those who had to enter the bathroom had to pass through these spaces; each of them has its own therapeutic properties. In Sardineh, which has a cool and dry space in the bathroom, people still had their clothes on, and at the time they came to greet and chat with other people to purify their souls as well as their bodies. Alongside Sardinah, however, there was the main bathroom space called Garmkhane with a warm and dry texture, which in fact was a space for bathing and having massage. After this, there was a warmer and more natural space called Khazine and thereafter it was a cold water pool which was named chalhoz. There was a strict rule saying that the water of Khazine and Chalhoz should be entered on one side and out of the other side so that the water inside of these two pools would remain constantly clean, which if they were not, they considered the bathroom unhealthy. Enjoying a warm Iranian bath is a unique cultural experience. For first timers it may be a little daunting, but once you get used to it, the Iranian bath often becomes an addiction; relaxing, healing, and regenerating its followers. 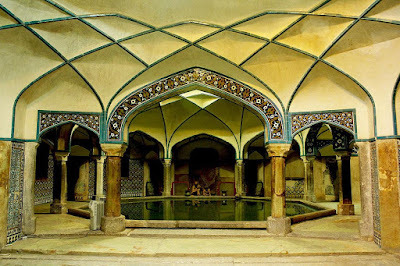 While you are in Kerman and Shiraz, don’t hesitate to visit Ganjali khan Hammam of Kerman or Vakil Bath of Shiraz where suggest you the relaxed and alive atmosphere of Persian Hammams.